Rebels in eastern Democratic Republic of Congo have forced thousands of civilians out of a town which they have taken from a pro-government militia. Laurent Nkunda's men took Kiwanja after two days of fierce fighting, before ordering about 35,000 people out of the town so they could search it. Meanwhile, Rwanda's leader blamed the Congoelse army and UN peacekeepers for not solving the crisis. He said they had failed to disarm Rwandan Hutu militia in DR Congo. Gen Nkunda's Tutsi rebels say they are fighting to protect the Tutsi community against Hutu FDLR rebels who fled to DR Congo after the Rwandan genocide in 1994. Rwandan President Paul Kagame blamed a failure of leadership in DR Congo. He also said the international community, including the 17,000-strong UN peace force, had failed to act. "What have they been there doing? What solution have they brought to the problem? What is the result of the $1bn they are spending every year?" he told the BBC. Mr Kagame is due to meet his Congolese counterpart Joseph Kabila at a summit on Friday in Kenya to be attended by UN chief Ban Ki-Moon to discuss the crisis. The FLDR and Mr Nkunda's CNDP group have not been invited to the Kenya summit, Mr Kagame said. The Rwandan leader maintained that those arguing that talks between Rwanda and Congo would resolve the current crisis were evading their responsibilities. "It is running away from the problem," he said. "I can assure you if this approach continues, six months down the road we will have another humanitarian catastrophe like this one." Rwanda's army, one of the toughest in Africa, has invaded DR Congo on at least two occasions since the 1994 genocide, saying it has to deal with the Hutu militia. Some 800,000 Tutsi and moderate Hutus were killed in the genocide. At least 250,000 people have fled their homes amid the fighting and many women and children were among those forced from Kiwanja on Wednesday. Kiwanja lies about 80km (50 miles) from the regional capital of North Kivu, Goma. In this latest fighting the Tutsi rebels clashed with Pareco Mai-Mai forces mainly made up of Congolese Hutus, who Gen Nkunda alleges are backed by the government. Witnesses reported killing and looting, and some people were wounded, a BBC correspondent who travelled to the town said. Tens of thousands of displaced people are already in and around Goma, which Gen Nkunda has threatened to attack - though the ceasefire around the city appears to be holding for now. In a significant hardening of their position, UN peacekeeping troops in Goma - who are reinforcing their position - have been ordered to fire on any armed groups trying to enter the city. The fighting at Kiwanja, near the Rutshuru, has forced some aid workers to suspend their activities a day after bringing in the first food convoy to rebel-held territory. 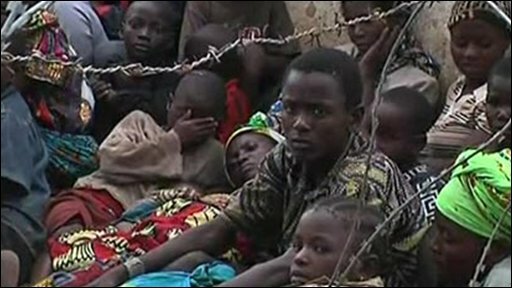 The UN refugee agency says three camps for displaced people near Rutshuru have been emptied and destroyed. The agency has been trying to establish the fate of about 50,000 people who had been sheltering in the area. The BBC correspondent who was in Kiwanja said a UN convoy that travelled north from Goma had so far only been able to deliver food and beer to the peacekeepers. 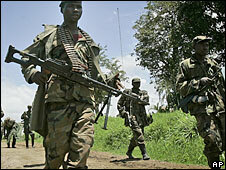 The convoy had turned back to Goma after the most recent outbreak of fighting, he said. Gen Nkunda has threatened to topple the DR Congo government in Kinshasa, 1,580km (980 miles) west of Goma, unless President Kabila agrees to hold direct talks. He has said his forces are now free to pursue their offensive, accusing the government of breaking the ceasefire. Correspondents say the militia involvement in the fighting makes any push for negotiations between Gen Nkunda and the government more complicated. The latest clashes sparked fears the rebels could follow through on their threat to attack Goma - or target Masisi, a hub for Rwandan Hutu rebels west of Goma where aid workers have been evacuated and that is now surrounded by Gen Nkunda's men. The BBC's Peter Greste in Goma says the rebel threat against Kinshasa could be hubris, as it is hard to see how he could transport between 6,000 and 7,000 fighters all the way across a country the size of western Europe. The rebel forces do, however, appear to have the strength to take Goma, he said.